Russia denies access of monitors to border crossings. 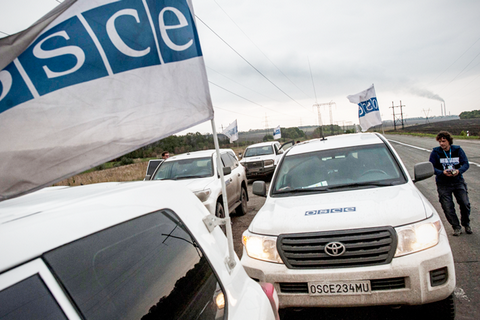 Special Monitoring Mission (SMM) of the OSCE in Ukraine reports cases transfer of manpower and weapons from Russia to the occupied territory of Donbas. "Despite combined-separatist forces' restrictions, the SMM continues to document evidence that Russia is sending troops and equipment into Ukraine," the US Ambassador Daniel B. Baer to the OSCE Permanent Council said in a 27 October statement. Baer says that "Russia can and does easily move weapons, fuel, and ammunition across the border, under the cover of darkness, and in the absence of OSCE observers." "On October 17, the SMM spotted a minivan with military license plates carrying personnel in camouflage as it crossed from Russia into separatist-held territory of Donbas," the official said. According to him, monitors spotted a bus with at least 20 persons in camouflage crossing from separatist-held parts of Ukraine back into Russia. "Taken together with the ramp up in access restrictions, this evidence is indicative of Russia's continued and active support of combined separatist-forces in Ukraine," stressed the US representative to the OSCE. He also said that Russia continues its subterfuge to cloak its activities from the international community. "Just last week, Russia again rejected proposals to expand the SMM area of operations to cover all nine border crossings from Russia into separatist-held areas in Ukraine," stressed Baer. The so-called "DPR" and "LPR" opposed placement of armed OSCE police mission in Donbas, although Russia has earlier stated the consent about such a mission.